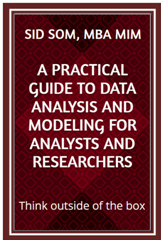 This book will introduce analysts and researchers to a whole new approach to data analysis and modeling. It will also guide them to think outside of the box while analyzing, modeling and presenting large amounts of data. In order to prove the depth and versatility of the proposed approach a series of sound analytics and models have been developed and applied to different financial markets – from equity to housing to human resources to property assessments to pre-owned autos and more.